Contents: This was the initial release of the Original Soundtrack Record (also called the 'drama play record'). 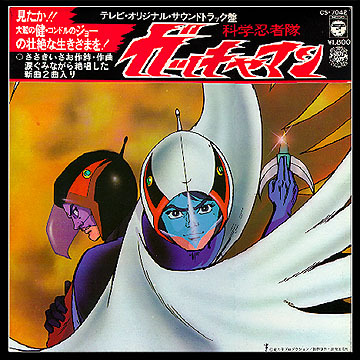 It included dramatic sequences from various episodes of the first Gatchaman series. It also included four song sequences. Additionally, this LP was released on audio cassette (CAK-629, ¥2,300) and compact disc (COCC-12586). Monaural.